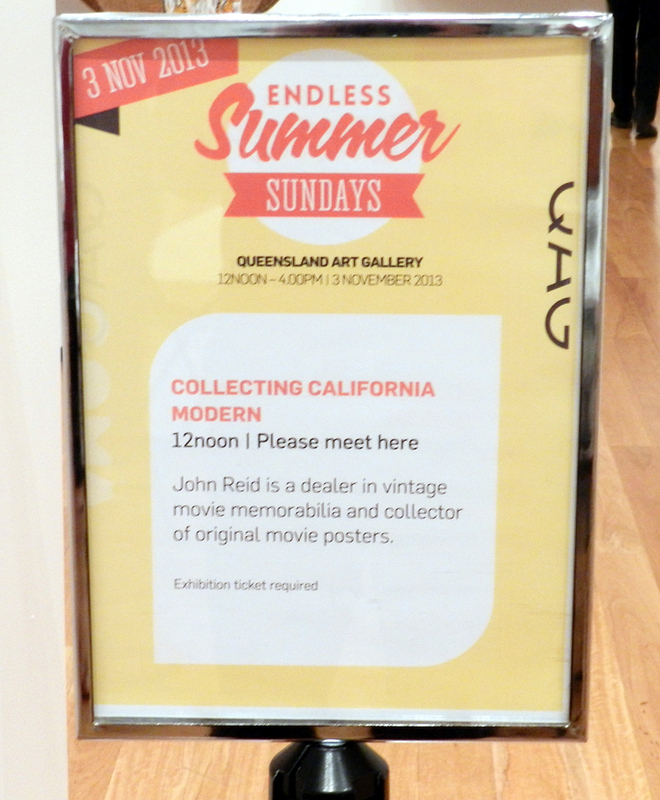 The Queensland Gallery of Modern Art (GOMA) invited me to be guest speaker as part of their Endless Summer Sundays California Design Living in a Modern Way Exhibition on November 3rd. The Gallery has once again produced a wonderful Exhibition with an eclectic mix of the iconic clothing, furniture, memorabilia and movie posters from 1930 - 1965. It was very encouraging to see a huge amount of interest in the presentation on Movie Posters. Many of the people who attended the Exhibition were not collectors and had very limited knowledge of movie posters so it was good to be able to introduce them to the hobby. I spoke about some of the unusual places that movie posters have been found. One of the most famous recent Australian finds happened when a lady purchased a derelict 1930s two bedroom house in an old country town in Victoria. It had been many years since anyone had occupied the house and the new owner planned to do a complete rennovation of the property. She started by removing the threadbare carpets and discovered a treasure trove of movie posters underneath the carpet. It seems that an old cinema had been located nearby and the carpet layers used movie posters from the cinema as a lining and a form of insulation between the carpet and the floorboards. The lucky new owner found hundreds of posters from the 1930s and 40s including some classic and very valuable Australian Daybills, one sheets and three sheets. She sold them off slowly and the value of the posters ended up being worth more than what she paid for the house. There have been many similar stories of movie posters turning up in the most unusual places. We talked about whether movie posters are a good investment or not. My view is that movie posters are no different to any other investment commodity. If someone is buying movie posters with the sole intention of making a good investment and reselling at some point in the future, they need to do their homework and study the results of auctions and internet sales. There is no doubt that there are bargains to be had on the internet with many posters selling for way under their potential. The key is to buy the good titles that are popular with many people and to buy at the right price. That takes experience and knowledge but it can be done. The fact is that many dealers can also be described as investors in movie posters. To be successful they need to buy well and make good investments and there are plenty of examples of very successful dealers. Posters for many lesser known films often only have value to a very limited number of people and have virtually no investment value at all. Of course, one of the key factors is that you never know what might turn up in the future - under floorboards or in an old collection. The value of a movie poster that has been considered rare can be greatly affected by a newly uncovered find of posters. The majority of people collect movie posters because they love a particular film or genre. Among the most popular subjects for collecting are Sci Fi, Horror, Surfing Movie posters, Star Wars, Marilyn Monroe and John Wayne but the list goes on and on. We talked about some of the famous collectors and their collections. Kirk Hammett, Nicolas Cage and others were examples. It was pleasing to see that the Exhibition featured the art of Saul Bass with examples of various movie posters and viewings of the opening titles of Man with the Golden Arm and Anatomy of a Murder. The Exhibit also featured other examples of Saul Bass designs. 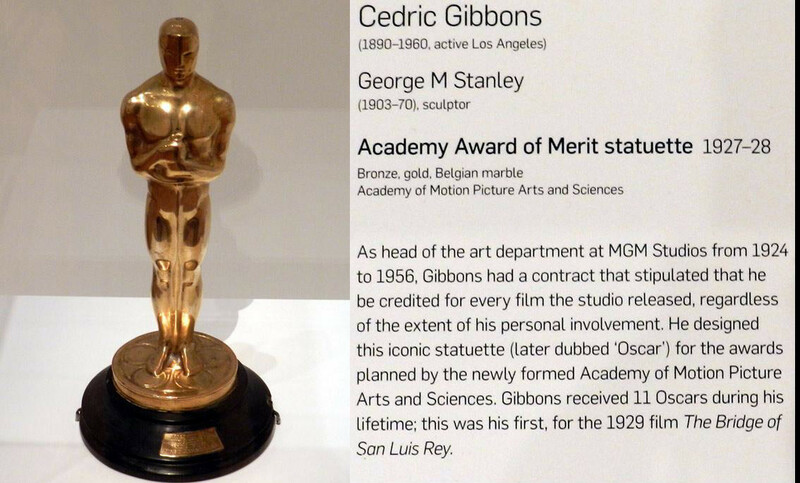 One very interesting exhibit was an Academy Award of Merit statuette 1927-28 designed by Cedric Gibbons, former head of the Art Department at MGM, and sculpted by George M. Stanley. The Academy Award Statuette attracted a great deal of attention and looked very impressive in a glass display case. As part of the presentation, I included Australian Daybills for Breakfast at Tiffany's, Endless Summer and some other posters that demonstrated a range in value from $10.00 to $1000.00. I talked about the worlds most valuable movie posters including Universal Horror titles like Dracula and Frankenstein, but many people in the audience were very surprised at how inexpensive many vintage posters were. I showed them examples of original movie posters that are at least 50 years old which can be purchased for as little as $10.00 or even less. In my opinion, the Holy Grail of Australian movie posters must be The Story of the Kelly Gang (1906), perhaps the most historically significant Australian film ever made and featured on the Unesco World Heritage List. We also discussed the Movie Poster Artists many of whom are often relatively unknown. The majority of movie posters never carried the signatures of the artists so it has been difficult to establish the names of the artists over the years. However, the art of movie posters is an important part of the graphic design and advertising history of the last 100 years. There were lots of questions after the event and it was a great opportunity to talk to people who had never considered movie posters as collectibles. Hopefully the presentation has introduced some new collectors to the hobby! The Queensland Gallery of Modern Art is to be congratulated on another successful Exhibition and it was particularly pleasing a Movie Poster presentation was included as part of the Exhibition. The Exhibition continues through to Feb 9th 2014.